Contains a blend of electrolytes, probiotics, nutrients & sugars to provide hydration & energy to young animals during times of environmental challenges. Contains a source of live (viable) naturally occurring microorganisms. Complete supplement for use in milk, milk replacer, or water. Single use packet when feeding to calves or foals - no waste and easy to mix! Multi-species use for calves, foals, lambs, kids, baby pigs, fawns, llamas and alpacas crias. Mix one 100 gm packet of Formula 911® into 2 quarts of warm water, milk or milk replacer. Shake or mix thoroughly. Prepare just prior to feeding. Feed two quarts of Formula 911® mixture to each calf or foal twice daily for the first two days. 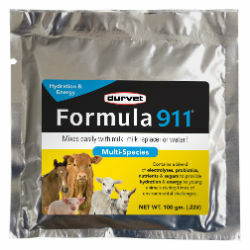 May increase Formula 911® feedings as needed up to 4 times daily. Receiving calves should be given 2 Formula 911® feedings prior to regular milk program. For lambs, goats/kids, baby pigs, fawns, llamas and alpacas crias feed 4 oz of the prepared Formula 911® mixture per 5 lbs of body weight, 3 times a day for 2 days.